This is a great way to renovate tired looking lawns and thicken thin turf for a plusher-looking lawn. 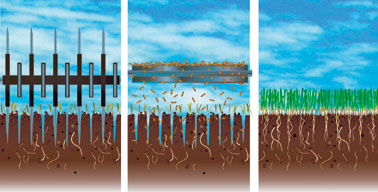 Slit seeding is achieved by a machine that creates small ¼ inch slits in the soil through existing turf. The seeds are then dropped directly into the slits to create a very high rate of seed to soil contact. Seed is distributed in a uniform fashion across the lawn and has a much higher germination rate than broadcasting. Grass seed requires moist soil to germinate into grass plants. It can take up to a month for all of the new seed to germinate and get established. A newly seeded lawn needs to be lightly watered daily in order to ensure good establishment. The newly germinated seeds have tiny, shallow roots and will die quickly if the water supply runs out. creates small slits in directly into the slits. seeds germinate.